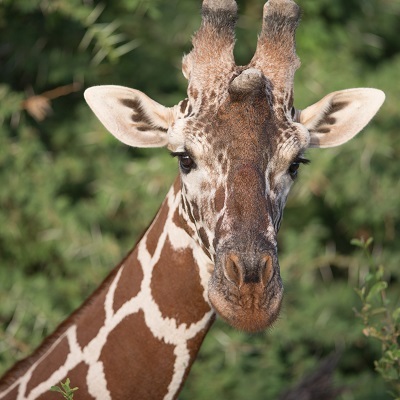 In early 2014, Copenhagen Zoo in Denmark announced that it planned to kill a healthy young male giraffe named Marius, on the grounds that he was genetically too similar to other individuals in the European captive breeding programme. Although Marius potentially had decades of life ahead of him, his fate was decided on the fact that he was related to too many other giraffes in zoos in Europe. Despite protests and offers to rehome Marius, he was shot in February 2014, and his body was publicly dissected before parts were fed to the Zoo’s carnivores. Born Free spoke out widely, condemning the incident and calling for a review of culling policies in zoos. Throughout the ensuing global outcry, questions were asked about how widespread the practice of killing healthy animals is in zoos. Opinions and reports ranged wildly, with disputed industry estimates reporting that between 3,000 and 5,000 healthy animals are killed across European zoos every year. Closer to home, it was not clear whether or not culling of healthy animals was a feature of zoos in the UK. Occasional reports of culling in British zoos had surfaced previously (for example, red river hogs at Edinburgh Zoo in 2010) but for the most part the situation in the UK was largely unknown. British zoos are supposed to maintain individual animal records, and make these records available for inspection by zoo inspectors. However, in my PhD research examining 192 British zoos, more than one quarter were found to be non-compliant with animal recordkeeping criteria at inspection. Zoos should also submit an annual animal inventory to their licensing authority which should include, among other things, the number of animals of each species that died in the preceding 12 months – but it does not include the cause of any deaths. Furthermore, my PhD research has shown that nearly half of British zoos failed to provide full annual animal inventory information to their local authority. So, in general terms, it seems that the central government, licensing authorities and zoo inspectors are in the dark surrounding the prevalence of causes of deaths of animals in zoos; and only individual zoos themselves know if and when animals are culled. Zoo membership associations such as BIAZA and EAZA, and collaborative bodies such as Species360 may collect relevant information on animal deaths but only from participating zoos (thought to be a minority) and more importantly this information is not available to the public. But now we have another glimpse into the problem: in a study of mortality of Eurasian lynx (a medium-sized wild cat) in UK zoos between 2000–2015, researchers from the Royal Veterinary College in London have revealed that culling was the leading cause of death, accounting for 21% of the deaths in the lynx population. While it involved relatively few animals overall (eight), the fact that more than one in five of the population was killed while healthy for reasons of space and genetics is shocking. Is this figure representative of other species in UK zoos? If it is, or even if that figure is a fraction of 21%, the scale of slaughter would be immense given the huge number of animals in zoos. Born Free is very concerned that zoos have been permitted to operate with relative impunity despite growing evidence of unethical and unpopular practices. That is why we must call on the governments across the UK (zoo legislation is devolved to the governments of England, Wales, Scotland and Northern Ireland) to ensure that, at the very least, zoos make summary information on the causes of death of their animals available to the public. The current legal framework in Britain permits zoos to operate under licence, and places requirements on zoos to meet minimum standards in animal welfare, conservation, education and other considerations. The British public – some zoo-goers, some not – should have a chance to make an informed decision about the merit and ethical basis (or lack thereof) of zoos. The debate on the role of zoos continues to rage, but will only be resolved when the facts are made public. Without a legal requirement for transparency in zoo activities, we risk continued confusion, compromise and controversy.